I have always noticed the Skunk Cabbage in Glen Providence Park, but only this year did I learn how remarkable these plants are. 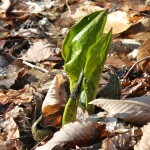 Eastern Skunk Cabbage (Symplocarpus foetidus) is native to eastern North America. It grows in soft wetland soils- you can find it growing in the wetlands along Broomall’s Run throughout the park. It flowers in late winter and early spring, when only the flowers and their protective covering are visible above the mud. The stems remain buried below the surface of the soil with the large, cabbage-like leaves emerging later. We found it emerging in the park on a bitterly cold day this January. How does it bloom in such cold conditions? Amazingly, Skunk Cabbage can generate temperatures of up to 15-35°C above air temperature: it literally melts its way through frozen ground, ice and snow. The heat it produces may help to spread its odor in the air, attracting early-emerging pollinating insects. 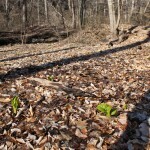 Skunk Cabbage gets its name from the pungent odor produced by breaking or tearing a leaf. This odor attracts its pollinators: scavenging flies, stoneflies, and bees. Its intriguing flowers are tiny, covering a yellow-green spadix, and are protected by an eggplant-like shell called a spathe. In the 19th century the U.S. Pharmacopoeia listed Eastern Skunk Cabbage as the drug “dracontium“. It was used in the treatment of respiratory diseases, nervous disorders, rheumatism, and dropsy. It is not considered edible raw, because the roots are toxic and the leaves can burn the mouth. 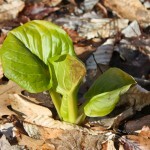 The Lenni-Lenape, or Delaware Indians, are among the Native Americans who used Skunk Cabbage medicinally. 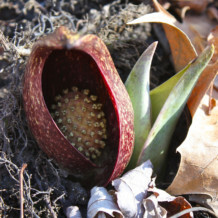 The Okehocking were the local tribe of the Lenni-Lenape who lived along Ridley and Crum Creeks, and they could have used Skunk Cabbage along Broomall’s Run. Not bad for one plant! You can follow the plant’s stages in our photo gallery below. The first image was taken in January, but the rest were taken yesterday- so you can see multiple stages of this intriguing plant during one visit to Glen Providence Park. 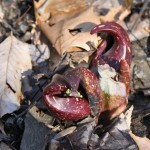 For more fun facts about Skunk Cabbage, read this entertaining article on TheNaturalCapital.com. Information from wikipedia unless otherwise linked. 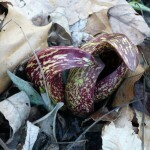 I recently stooped peering into a spathe of skunk cabbage, wondering about its spadix. Thanks for this natural & cultural history! You are quite welcome, Scott! We are learning so much about the park and its inhabitants- it is fun to share what we learn. Hi Helen, I don’t have any information on whether extracts of Skunk Cabbage are used today for epilepsy or other conditions. While Native Americans used Skunk Cabbage traditionally, they had to handle/process it a specific way, as Skunk Cabbage can be toxic. I don’t know how to find specific information on how it was used, or whether it was effective. The best of luck in finding optimal treatments for your daughter.